Most of us have a sense that we shouldn't eat too much sugar, but what is it actually doing to you? We look at the journey that sugar takes around your body, and find out how to use this knowledge to your advantage. When a sugary food or drink passes through your mouth, your brain immediately registers the sugar. Your body doesn’t need to break down this source of glucose in the way that it does for say, grains or pulses, so the sugar enters your bloodstream and releases its energy more quickly. This can produce an instant energy boost that some people describe as a ‘rush’1. It also triggers your pancreas to produce insulin, which controls levels of sugar in your blood2. During digestion, the sugar travels through the portal vein – which moves blood from the spleen and gastrointestinal tract – to the liver. After delivering any energy needed there, it continues around the rest of the body3, and any spare energy is stored in the muscles and fat so it can be used when reserves are low. It’s an efficient process, which, if you eat a healthy diet and take plenty of exercise, should produce a happy equilibrium. Teeth: As soon as sugar enters your mouth, the bacteria in your mouth start producing acid, which can cause tooth decay4. Brain: Sugar sustains you for less time than a slower-releasing energy source such as nuts or protein. Some people describe experiencing an energy dip after eating sugar: a lethargic feeling that may make you less active, drink excess caffeine, or crave more sugar5. Insulin: Your pancreas reacts to sugar by releasing insulin to regulate your blood sugars. But if this happens too often, your body stops reacting to the insulin6. Insulin is also disrupted by chemical and hormonal changes in obesity – particularly by fat cells around the abdomen area7. As insulin becomes less effective, glucose starts building up in the blood, which if left unchecked, can lead to diabetes8. Fat levels: A high-sugar diet is an all-too easy way for your body to regularly take in more energy than it expends, which can lead to obesity. This, in turn, is linked to a whole range of illnesses, including heart disease, stroke, diabetes, arthritis and some types of cancer9. “If your diet is persistently high in sugars – increasingly common in modern life – your insulin levels will be spiking frequently,” explains Bupa Global Medical Director Dr Amit Sethi. The journey is slightly different for one type of sugar: fructose. Compared to sucrose and glucose, it sounds like a healthier option, as it’s derived from fruit. But actually, fructose loiters around the liver whether it’s needed or not, and too much can cause a fatty liver and result in serious problems10. Eating the small quantities present in fruit is fine, but otherwise, avoid it where you can. The less sugar you eat, the less you’ll want. Try cutting down – or if you’re brave, cut it out altogether and feel the cravings fade away. Experiment with different ways of sweetening foods, such as fresh fruit and cinnamon. Look out for fructose. You’ll find it on some food labels, but it’s also in sucrose (normal table sugar) and high-fructose corn syrup, found in products including soft drinks, cereals, baked goods and sweets. Get a good night’s sleep. 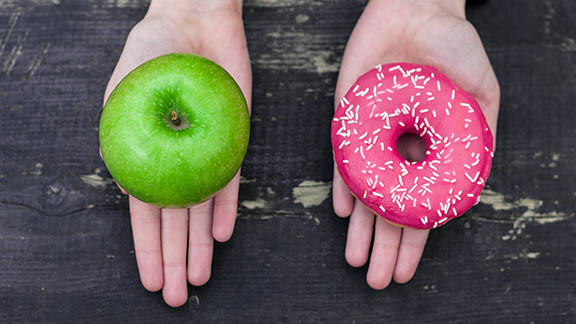 You are far more likely to crave sugary foods if you’re tired11. Look for foods that will keep you full for longer, such as wholegrain foods and protein12. If you choose reduced-fat foods, make sure they don’t include extra sugar to compensate. Understanding what foods can do to your body and your general wellbeing can help you make better choices about what to eat. To help develop a healthier attitude to food, you can find out about ‘mindful eating’ in this article.